Thousands of public transport passengers were left stranded on the streets of Athens today, after drivers told them to disembark around lunchtime, then drove their vehicles back to their depots. The unions’ decision to act in concert is likely to cause gridlock for days. It came after the Athens prefect issued an order to commandeer Metro workers back to their trains. Movement in Athens has already been difficult with the Metro on strike for eight days, and bus, trolley and tram unions dipping in and out. Transport workers are unhappy with the streamlining of public sector wages, but the government told unions today that it can’t favour particular groups. "The government made it clear during talks that there was no leeway to exempt anyone from the consolidated [state] payroll," Development Minister Kostis Hatzidakis told reporters after the wage talks ended. "Despite this, the unionists decided to take the path of blind confrontation... There's nothing we can do but to requisition workers." Dimitris Stratoulis, an MP and spokesman for the radical left opposition, Syriza, said "the coalition has dressed in fatigues, and is conscripting the strikers in an unconstitutional coup." He indicated that Syriza will seek to broaden the confrontation by backing the unions and forming a "Great Wall" against which "conscription will be smashed." Public sector workers were consolidated onto a single payroll and pay scale last year, which equalised weaker unions with those that had more bargaining power. Transport workers in Athens have traditionally had a lot of political clout and have, over the years, won favours in pay and benefits. 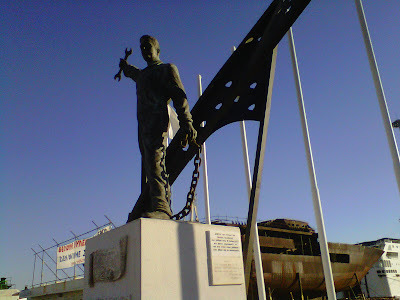 I was in the dejected neighbourhood of Perama last month, producing a long-format report for PBS NewsHour on the high unemployment rate (about 50 percent) stemming from the collapse of the shipbuilding and ship repair industries that once underpinned the economy there. Some smaller, private shipyards continue to offer employment to about half of the number of men they employed before the crisis. But the mammoth shipyard owned by the Peiraieus Port Authority (OLP) - the so called zone - is the worst-affected. There unemployment stands at about 90 percent. We met several metalworkers who had served, or were about to serve, stints in places as far away as Russia and the Congo. These work contracts usually only last a couple of weeks or so, but even a few days of work a year can provide food on the table. At the cafe that stands in the largely desolate shipyard, unemployed workers gather to grumble and, as on the occasion when PBS was there, openly fight about who is to blame for the crisis. One worker accused another of being the author of his own demise for drinking his salary in the good years, when he was earning as much as 2,000 euros a week. Another blamed the union for pushing day rates and benefits up too high (for metalworkers they still stand at close to 200 euros a day after benefits, although the private shipyards that are still in business have made private agreements that lower those rates considerably). At the entrance to the zone stands a monument that at first looks like a tribute to socialist realism put up by a union, or perhaps the communist party, whose traditional stomping ground Perama has been over the years. But it is none of the above. 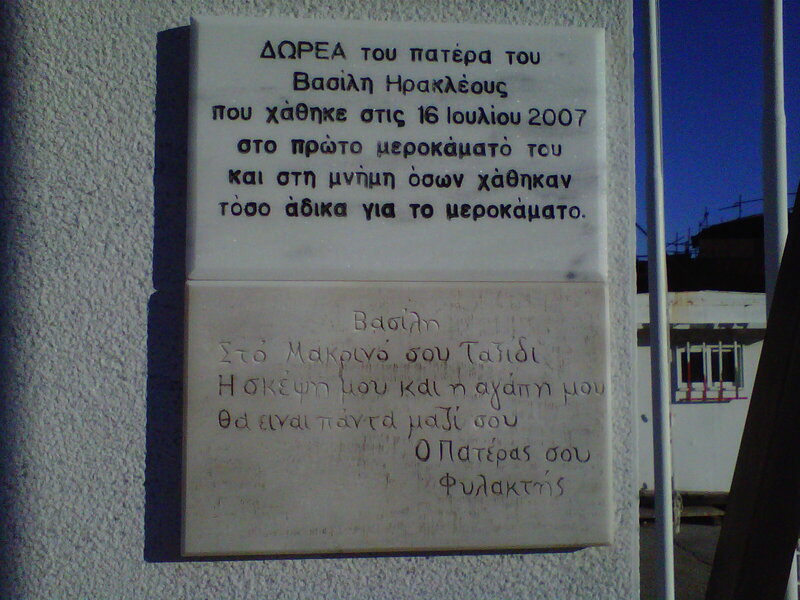 This is a private tribute, erected in honour of Vasilis Irakleous, a young man killed on his first day at work in the zone, on 16 July 2007. "Vasili, On your long journey, my thought and my love will be with you always. Your father, Fylaktis." A war of words is mounting between the Greek government and opposition over a series of terrorist acts that have targeted politicians and journalists over the past week. Radical left opposition party Syriza yesterday issued a belated statement condemning the symbolic shooting of nine rounds from a Kalashnikov rifle into the offices of conservative New Democracy in the small hours. But it added that the attack "exudes an fragrance of parastate terrorism." 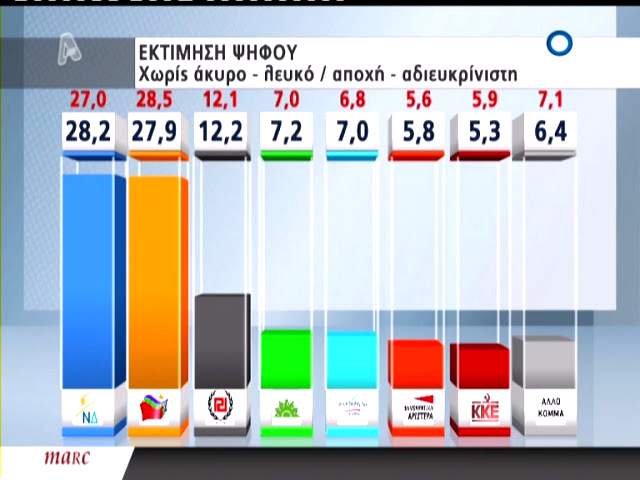 It also accused New Democracy of trying to cash in on the publicity. Later in parliament, socialist leader Evangelos Venizelos accused Syriza of "a violence-friendly anxiety, a flirtation with variations of violence". The socialist party is the conservative-led coalition's main ally, with 24 MPs. No one was injured the the attack on New Democracy, which police say took place at 3am on Monday. Police found nine Kalashnikov shells on the median between Syngrou avenue and a parallel access road, three doors down from New Democracy's offices. They say they also found one Kalashnikov slug in the party office of Prime Minister Antonis Samaras, New Democracy's leader. The latest round of intimidation began in the small hours of Friday, with unknown assailants placing rudimentary explosive devices using camping gas canisters outside the front doors of about half a dozen journalists. Those attacks culminated on Sunday with an explosive device outside the door of the government spokesman's brother. The year has begun with an already tense parliament, after the government tabled a controversial tax bill that is to raise 2.3 billion euro more in direct taxation on companies and individuals than was raised last year. At the same time, the government is cutting more than nine billion euros' worth of public spending this year.